One of my favorite contemporary philosophers is the University of Toronto professor, author, essayist, and critic Mark Kingwell. He apparently has quite the following in Canada, but we Americans haven’t caught on yet. I discovered his work by accident last year while doing research for an interview with New York Times bestselling author Sylvain Reynard. Reynard who writes under a pen name, is an anonymous Canadian author who is shrouded in mystery. If you’re curious about him, click here.http://http://www.sylvainreynard.com/ He’s a brilliant guy, kind to a flaw, and his proses are effortless. No one aside from Jesus does redemption better. But I digress. Kingwell’s name came up an article on Reynard. There was speculation that perhaps Kingwell and Reynard were one in the same. Having read both their works, I don’t see it. Their literary voices are vastly different. Reynard seemingly is a strong man of faith. Hope and redemption are prominent themes in his books. Kingwell, from all accounts, is a atheist. He refers to himself as a rehabilitated Catholic. There are other glaring differences, but we’ll save those for another time. Kingwell has written twelve books. You can see a list of his work here.http://http://www.philosophy.utoronto.ca/directory/mark-kingwell/ Today I want to focus on two of my favorites. 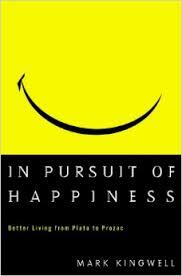 A Civil Tongue (1995) and In Pursuit of Happiness: Better Living from Plato to Prozac (2000). In A Civil Tongue, he takes on political discourse and culture. He believes social justice can be achieved through an open and honest dialogue. He refers to this as “the talking cure.” He is a proponent of tolerance, reason and civility — how very Canadian of him. In a time when political discord is out of control, his ideas are refreshing. Imagine a world where we actually discuss our political views in a rational, sane way, where we offered up ways to make a difference, where the blame games were nonexistent, and we listen to the other side. Imagine if we not only listened but showed respect for others’ point of view. If we could change political discourse, we could change the world. In Pursuit of Happiness: Better Living from Plato to Prozac (2000) explores the nature of happiness and human nature in an engaging and entertaining way. Pop culture references are found throughout — everything from The Simpsons to Pepperidge Farm goldfishes. Naturally the works of some of the greats in philosophy play a prominent role. Spoiler alert: Aristotle plays a leading role in the book. Kingwell is a fan. He also takes us into the New Age movement with a hilarious anecdote of his time at a happiness camp. He tried Prozac just to see what all the fuss was about. Kingwell asserts that happiness isn’t a feeling. Happiness is not about “feeling” good all the time. “Sometimes good enough is enough.” Reflection and introspection about one’s life are crucial to peace of mind. It is not enough to just be in the world; one must also feel connected to humanity and the collective good. This can be an arduous task in our modern society in which we are inundated with information. This constant stream of noise that can leave us feeling out of the loop Kingwell refers to as “upgrade anxiety” –the feeling that we have to catch up. This feeling can zap us of our energy and overwhelm us. Paradoxically, no man is an island. Much emphasis is placed on intimate relationships as being fundamental to happiness, yet solitude has sparked some of the most creative minds in history. Kingwell also states the seemingly obvious, that material goods can’t buy happiness. Happiness is not about getting everything we want. In fact, having all of our heart’s desires can lead to unhappiness. It is in the striving that we find meaning. A Civil Tongue (1995) and In Pursuit of Happiness: Better Living from Plato to Prozac (2000), are books everyone should read. Kingwell’s writing is flawless without being pretentious or preachy. His wit is a thing of wonder. He’s truly the “every man and woman’s philosopher.” He’s hip, snarky and smart. Who needs happiness camp or Prozac when you have a Kingwell book?